What is a Tarsal Coalition? A tarsal coalition is an abnormal connection that develops between two bones in the back of the foot (the tarsal bones). This abnormal connection, which can be composed of bone, cartilage, or fibrous tissue, may lead to limited motion and pain in one or both feet. 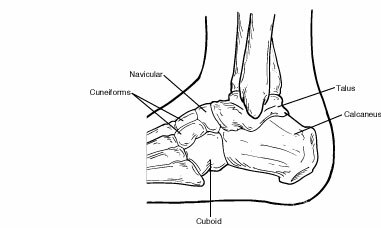 The tarsal bones include the calcaneus (heel bone), talus, navicular, cuboid, and cuneiform bones. These bones work together to provide the motion necessary for normal foot function. Most often, tarsal coalition occurs during fetal development, resulting in the individual bones not forming properly. Less common causes of tarsal coalition include infection, arthritis, or a previous injury to the area. While many people who have a tarsal coalition are born with this condition, the symptoms generally do not appear until the bones begin to mature, usually around ages 9 to16. Sometimes there are no symptoms during childhood. However, pain and symptoms may develop later in life. A tarsal coalition is difficult to identify until a child’s bones begin to mature. It is sometimes not discovered until adulthood. Diagnosis includes obtaining information about the duration and development of the symptoms as well as a thorough examination of the foot and ankle. The findings of this examination will differ according to the severity and location of the coalition. In addition to examining the foot, the surgeon will order x-rays. Advanced imaging studies may also be required to fully evaluate the condition. Physical therapy. Physical therapy may include massage, range-of-motion exercises, and ultrasound therapy. Steroid injections. An injection of cortisone into the affected joint reduces the inflammation and pain. Sometimes more than one injection is necessary. Orthotic devices. Custom orthotic devices can be beneficial in distributing weight away from the joint, limiting motion at the joint and relieving pain. Immobilization. Sometimes the foot is immobilized to give the affected area a rest. The foot is placed in a cast or cast boot, and crutches are used to avoid placing weight on the foot. Injection of an anesthetic agent. Injection of an anesthetic into the leg may be used to relax spasms and is often performed prior to immobilization. If the patient's symptoms are not adequately relieved with nonsurgical treatment, surgery is an option. The foot and ankle surgeon will determine the best surgical approach based the patient's age, condition, arthritic changes, and activity level.